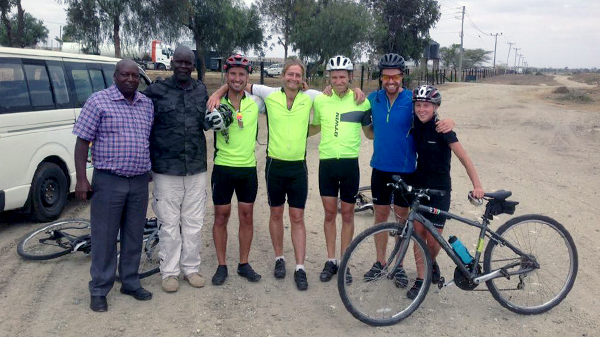 We set off at 9am from Naivasha and immediately began one the hardest, longest elevation stretches of the whole bike ride; 17 miles long and a climb of 3,000ft out of the Great Rift Valley. It would’ve been nice for a gentler start to day two but we knew it was coming. For all the months of training we’ve done back in the UK, I’m not sure there isn’t anywhere you can train at home that is a constant incline. The view at the top of the climb – 8,800ft above seat level – offered some stunning views over Western Kenya. As you can imagine, the air is thinner and the temperature is much colder, which presents a different challenge and we were getting through food and energy drinks pretty quickly. The rest of the ride was relatively flat/downwards after that as we headed towards Nairobi. The roads were much quieter than usual today ahead of tomorrow’s national election for the presidency. We arrived at our base sit around 3pm to give us plenty of recovery time ahead of tomorrow, where we head for Kajiado. Spirits are good and we’re looking forward to tomorrow. To donate towards The Walk Centre primary school, please visit: www.aaf.african-adventures.co.uk/the-big-bike-ride.